I love the colours in this photograph. So cool and yet homely at the same time. Beautiful. 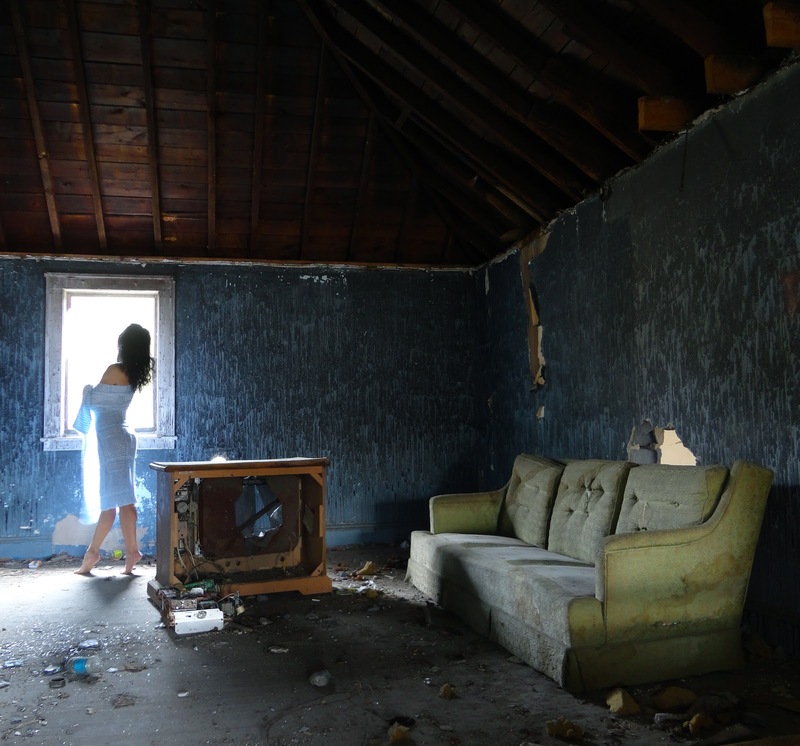 @Harper Eliot - I was absolutely gaga over this room (the entire string of abandoned apartments, actually!) the first instant I set foot inside of it. There had been a fire in this particular room, and water had streaked the soot-stained, blue walls...it created a startlingly beautiful effect. It's always nice to see you on here - Thanks so much for comin' back by! I love how the blue of your outfir creates a glow in the room. Great shot. So....nothing good on TV, huh? I love this composition, and the mixture of colors and textures, as well as your pose. It's very effective the way the strong back lighting from the window didn't overpower the scene. Very beautiful!!! @Anonymous - Definitely wasn't anything to look at on the TV, Haha! The last time I was at this place a few months ago - the TV was over in the corner of the room, and it wasn't all busted up (like it is now). This time, there were definite signs indicating that squatters have moved in...I was so nervous that one of them might come home and catch me in the midst of my shoot! Luckily however, that didn't happen - Thank Goodness!!! Part of the reason that I love the old, abandoned buildings that I shoot in so often - is that there is always this strange sort of beauty in their dilapidation...it's usually just there (abundantly so) through no fault of my own...and because of that, I feel like I can't take much credit for a picture turning out the way the one above did...ya' know? I really appreciate you coming here and commenting though, and I'm stoked to hear that you like this snap!!! Perhaps you can't take credit their beauty, but you certainly deserve a great deal of credit for your ability to see and capture that beauty, as well as augmenting it with both yourself, and your artistic sense of style. I've also been drawn to the weathered dignity of old abandoned buildings and have been curious about the mysteries they might contain. I've even explored a few when I was younger, but I suppose now that I'm pushing 70 and living alone, I feel a certain kinship with them as well.